Good email practices start with the sender and subject lines. If you don’t have these in order, nothing else matters. Here are some ideas for improving your deliverability. Try this little experiment: Go to your email software, be it Gmail, Outlook, or whatever, and open it. Quick, what do you see? The first thing you’ll notice is the sender. It is usually the first item on the left, or appears above the subject line, often in bolder type than the subject line. Given this fact, it is safe to say that nothing is more important than a good-looking sender address, especially when one looks at the statistics: 64 percent of small businesses executives said they decide whether or not to open an email newsletter based on the sender,1 and over 50 percent of respondents cited knowing and trusting the sender as the primary reason for opening an email in the first place.2 Even more disturbing, 73 percent of people decide to click on the “report spam” or “junk” button based on the sender’s email address alone!3 Ideally, your sender information should be personalized enough so that they see either a name or company, or some other title that has meaning to them (“Advanced Widgets Weekly Newsletter”). Ideally, your Sender name should make sense to the recipient. If the mail is a newsletter, a sender name that contains the company name and the word “news,” or “newsletter” is helpful. If your company is large enough to have different branches with different branding, then it’s a good idea make sure the domain matches the sender information. The second thing they notice, obviously enough, is the subject line. If the sender’s address has done its job, the subject line won’t have to work quite as hard to catch the reader’s attention, but that doesn’t mean you’re out of the woods yet. 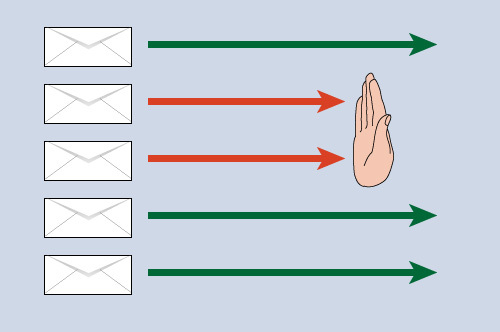 35 percent of email users open messages because of the subject line. A relevant subject line is going to have a better open rate than a generic one, naturally, but what does “relevant” mean exactly? In one sense, it means a subject line that is personalized for the recipient, but when most people think of a personalized subject, the first thing that comes to mind is the dreaded “[First_Name], have we got a deal for you.” The ability to insert merge tags into subject lines has been so thoroughly overused by spammers that doing it at all is a risky proposition. It might be okay for a triggered email, such as a birthday greeting or anniversary, but even here, we caution against making a first name merge tag the first element in the subject line. Several studies report that people react more favorably to this tactic when the name is inserted at the end of the message (e.g., “Here’s a birthday coupon for you, Jim”). Others studies suggest that using the first name in a subject line at all is the kiss of death. A far better approach to subject line personalization is to use dynamic content instead of merge tags. So what’s the difference? A merge tag is simply a piece of information stored in a recipient’s demographics. First and last name, address, city, state, membership level, most recent purchase, age, gender, etc. are all examples of merge tags. Even the most basic email marketing application can insert one of these at any point in the email and the subject line. Dynamic content, on the other hand, is not a fixed piece of information, but is a form of request based on one or several variables. It is often represented in an “If/Then” format (if x is true, then do this). It can take the information in the demographics and break it down further (into age groups for instance), or combine two or more demographics to yield different results (women in California, for example). Dynamic content requires a bit more advanced planning, but it pays off in the end. For example, if you want to offer people different discount rates based on their membership levels, you could create a logic condition that says if the customer’s membership level is gold, the subject line should read, “Here’s your 20% Gold Member only discount coupon,” while for everyone else it should read, “Here’s your 10% discount coupon for our store.” It is also possible to use more than one block of dynamic content in a subject line, so that, if you wanted to steer people to certain departments based on past purchasing patterns, or other demographics, such as age or gender, you can add these conditionals to the subject line as well. Clever combinations of dynamic content can make a subject line appear hand-typed specifically for a recipient. An even more powerful feature for email marketing is the ability to change the sender dynamically. As previously mentioned, the sender is the first thing anyone sees. With dynamic content, you could, for example, change the sender based on where a recipient lives. In that case, the mail could come from your West Coast representative for anyone residing in California, Oregon, or Washington; or a department store may want to assign reply duties to whichever department a recipient shops in the most. Not all email marketing software offers the ability to add dynamic content to the sender and subject lines, but it is a feature you shouldn’t overlook. Marketers are moving away from simple email blasting, and beyond social media connectivity, with a trend toward using data to provide a unique experience for each email recipient. The business that is already doing this is ahead of the game. To learn more about the dynamic content capabilities available in Goolara Symphonie, click here to visit the Features section of our website. This entry was posted in Deliverability, Dynamic Content, Email marketing and tagged address, demographics, sender, subject line on September 4, 2012 by Jim Morton.